Music / Oriana Chorale and Polifemy (dir Robyn Mellor). “Death & Redemption”. At the Chapel, Canberra Girls’ Grammar School, May 20 2018. Reviewed by ROB KENNEDY. 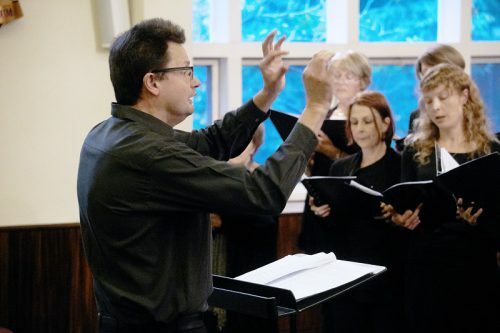 THE human voice has the most subtle and profound qualities of any musical instrument, especially when heard in the intimate setting of a chapel. 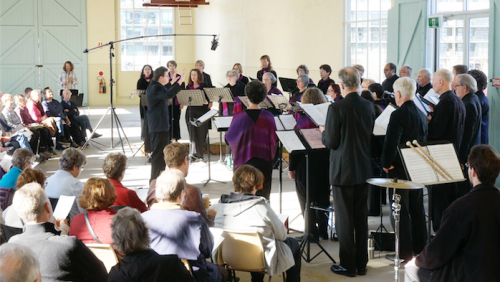 Conductor, musician and director Robyn Mellor led the Oriana Chorale and the six members of Polifemy through songs of death and redemption in the Chapel at Canberra Girls’ Grammar School. Renaissance composer Giovanni Pierluigi da Palestrina, known for his sacred music set his mass for the dead “Missa pro Defunctis” in 1554, and it is just as moving today as I imagine it was then. This setting had three sopranos up in the loft near the organ; they began the “Indroitus” in what could be described as heavenly voices from above. The whole chorale then entered as a response to the sopranos; it was a divine sound. The nine movements of this mass covered the traditional chants of the Sanctus, Kyrie, Agnus Die and others, and it ends with a Requiescat. The Benedictus stood out for its colour and dynamic. The whole mass was sung with a balance of beautiful tone blending between sections with many clear and strong individual lines. After the interval, The Seven Penitential Psalms that are expressions of sin and repentance were sung in order to demonstrate the changes in musical styles from 1585 to 1620. Psalm 102, set by Orazio Vecchi, lifted the rafters of the chapel in a short burst of dynamic prayer that asks for forgiveness. Psalm 38, set by Carlo Gesualdo, was a sensitive and flowing polyphonic work that showed how well the chorale could sing together in their quiet and loud dynamics. Giovanni Gabrieli, one of the most influential musicians of his time set Psalm 51 for six voices. Through this quiet and lamentful work that ebbs and flows with subtlety and passion, and then moves to a full and glorious harmonious rising unison was the standout piece for this reviewer. Psalm 32, by Giovanna Croce, was set to a reduced text by Francesco Bembo. This unique work had the chorale divided up into many sections, which created a striking polyphony. Psalm 130, set by Orlando di Lasso began softly with all singers chanting as one. Throughout this lullaby-like work, it became an almost perfect combination of sound and visuals as the sun set behind the singers to its hushed conclusion. Psalm 6, by Claudio Monteverdi and Psalm 143, by Melchior Frank followed, then the Psalm 96/98 “Sing to the Lord a New Song’’ by Claudio Monteverdi sprang into a joyful and bright setting. The full chorale came together as one and gave a sparkling performance of this strong and profound work. This concert left the audience clapping loudly even after the singers had left the stage. 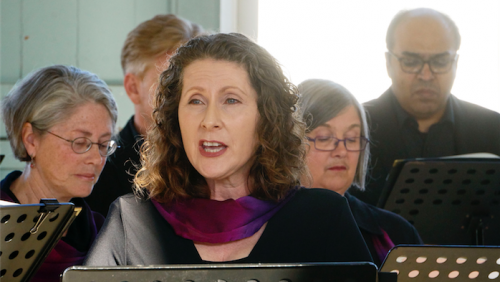 EVERY now and again we get to hear something extraordinary, and this time it was the Oriana Chorale performing a program of (mostly) Russian and Baltic music in the remarkable acoustic space that is the old Fitters’ Workshop in Kingston. Most of the concert was Russian Orthodox liturgical music, the rest with some influence from it. The choir spread themselves along the long eastern wall of the building, which allowed them more space than if crowded into one end of the room. It may also have enhanced the immersive soundscape of the concert as the music flowed over and around the audience. What could have been a mushy noise was clear and distinct, with each section of the choir and vocal line clearly discernable. Musical director and conductor Peter Young noted in his introduction that the works selected were chosen to suit the acoustic space and he succeeded notably. An interesting addition to the concert was a series of short soprano saxophone improvisations from John Mackey. These were played between some of the many short vocal works that made up the concert, and acted as punctuation in the flow of the concert, and as short breaks for the singers who otherwise sang for close to an hour and a half. These were a tasteful and thoughtful contribution to the concert. The highlight was Arvo Part’s “The woman with the alabaster box”, which is a marvel of vast and unexpected chords along with extended drones from the sopranos and altos. This was a piece of music so glorious that one of the sopranos could not keep the grin off her face from the pleasure of being part of it. Also enthralling were two works by Lithuanian composer Eriks Esenvalds. The first was a setting of a 13th century hymn text and the second by an early 20th century American poet, which jarred a little textually and stylistically with other works in the program, but a very pretty piece of music. Six varied pieces from Rachmaninov’s All-Night Vigil, Op.37 to finish up brought the concert back to its liturgical base, with one being revisited as an encore with added saxophone. The Fitters’ Workshop certainly works as a venue for vocal music, at least that music that relies on a cathedral-like ambience. On a sunny winter afternoon it was comfortable, but the very structure that makes it such an acoustically useable space must also limit when it would be viable as a performance venue. A winter evening in there could only be imagined as character building. At the very least Peter Young and the Oriana Chorale have shown what is possible. THE soaring hall at University House was the venue for this 40th anniversary twilight concert by the Oriana Chorale. The name of the ensemble was taken from the 1601 publication of “The Triumphs of Oriana”, a book of English madrigals by various composers in honour of Queen Elizabeth I. Fittingly, the first two pieces were from that collection, songs by John Bennet and Michael East. These were followed by two madrigals by William Byrd, whose work was not included in the “Triumphs”, but in the English madrigal tradition, if a little jauntier. The next three works by Monteverdi were a shift in language and style. These were noticeably more complex and lush, marking the musical development from the Renaissance to the Baroque. After the English madrigals these are much more “modern” in style. There was then a temporal leap forward of a couple of centuries to a 19th century English composer, Robert Pearsall, an amateur musical antiquarian composer who was a madrigal enthusiast. His “Lay a Garland” was a slow but interesting piece, but spoilt slightly by one of the tenors drifting off key. The next group of songs were in French, by Debussy and Saint-Saens. The Debussy work was two verses bridged by a delightful and unexpected chromatic line, while the three works by Saint-Saens were the highlight on the evening. The Chorale worked flawlessly as an ensemble and the repeat of the last line in the second work “Calme des nuits” was exquisitely beautiful. Oriana have the benefit of a talented composer, Phil Batterham as one of the singers and his setting of a poem by another member, soprano Sarah Rice, was another highlight. A reflective setting of interesting words and an absolute cracker of a last chord. The final section was a selection of choral dances from Benjamin Britten’s “Gloriana” and one by Gerald Finzi, another English composer of the first half of last century. The Finzi work sounded like a modern hymn one might encounter in a determinedly up-to-date Anglican church somewhere. All well done, but not as satisfying as the Saint-Saens. The concert was over in a hour and the Chorale and musical director Peter Young were deservedly pleased with themselves at the end. Wesley Uniting Church, Forrest, Thursday, April 17, 7.30pm. 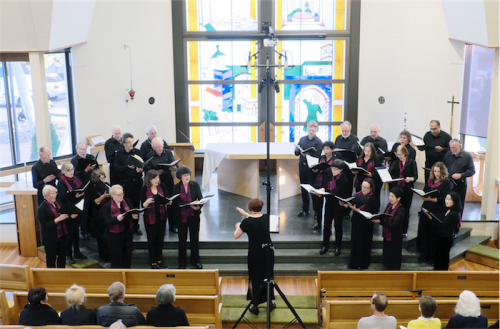 The power of the word and the many possibilities of harmony were the themes of the Oriana Chorale's Easter concert, which followed the structure of the Catholic mass. What comfort this ritual provides with its message of transcendent hope in the face of death. Many Canberrans have lost their jobs in the name of achieving to ''strategic efficiencies'', but such efficiencies pay no heed to the economic and emotional cost to human lives. Oriana's Mirrors in Mirror provided a different, preferable model of leadership, one that unites the disparate talents and experience of a large group of people of different ages to produce music that is greater than the sum of the individual voices. Arvo Part's Summa, followed by Randall Thompson's Alleluia, with choristers cleverly placed throughout the church, enfolded the audience in soothing sound. Part's compositional style uses the building blocks of melodic movement - the scale and arpeggio in interlocking sequences to create expanding harmonies that have extraordinary healing powers for the listener. The melodic line seems to calmly step through time, collecting shattered debris to reconstruct meaning and sound into a new spacious form. Bach's motet Der Geist Hilft BWV 226 contrasted with the opening pieces, depicting in its jangling counterpoint the confusion of souls in turmoil: ''We do not know what we should pray for, or how we ought to pray''. The answer was voiced in the Gloria of Part's Berliner Messe, and his compositional skill conjured up the beating of mighty, enfolding angelic wings in the phrasing of Qui tollis peccata mundi. The jewel in the concert was the youth ensemble, Kompactus' performance of Rene Clausen's lovely work, Set me as a Seal. The phrasing and entries were neat, and the enunciation was elegant. What a joy to hear this disciplined group of young musicians! At the heart of the evening was the steadfast musicianship of the instrumental ensemble led by Barbara Jane Gilby. With Calvin Bowman, Gilby performed Spiegel im Spiegel, a work of such seeming simplicity that never fails to clear the mind and offer a new vision of life, and this was performed with perfect economy and focus. Eric Whitacre's Lux Aurumque and Henryk Gorecki's Totus Tuus were favourite moments. I marvel at Whitacre's ability for vocal writing - the synchronised fading and emerging of sustained phrases. With closed eyes, the vision of Mary shimmered, in a heightened reality, brought to life in Gorecki's matchless gift for activating supernatural power within repeated chant. This was indeed a concert to ease the soul. St Paul's Anglican Church, Manuka, Saturday April 16. I greatly enjoy the care with which David Mackay constructs each program presented by the Oriana Chorale. The repertoire often presents old favourites balanced with less well-known works, and usually there is a bold exploration of new and demanding choral territory to test the singers. In this concert, it was Nicholas Maw's One Foot in Eden that provided the challenge. Positioned at the heart of the concert, Maw's setting of Edwin Muir's powerful poem resonated with the poet's contemplation of the balance between innocence and experience, creation and destruction, birth in paradise and the mortal round. 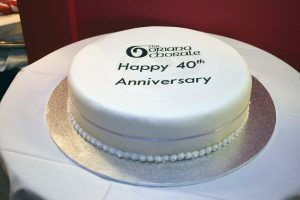 The Oriana Chorale gave a memorable performance and anchored One Foot in Eden as the dramatic balance point of the concert. Gerald Finzi is a composer who captures an essential equanimity and contentment in his depiction of English pastoral themes. The open modality of his settings create a spaciousness encouraging contemplative listening and the choir brought the lyrics to life, particularly in Clear and Gentle Stream with the basses and tenors singing a deliciously evocative phrasing of 'the fish lie cool in their chosen pool'. These songs were an interesting contrast to the three flower songs by Britten. Claude Le Jeune's Reveci Venir du Printemps was sung with a gentler approach than many versions, inviting both singers and listeners to savour the 16th-century harmonies rather than bouncing from chord to chord. The delivery had a stately progress, building to a grand conclusion. After interval, the choir performed Jan Sandström's setting of Es ist ein Ros entsprungen, creating a wonderful sound world, with the choristers and octet spaced in the nave to generate layers of harmony to fill the cathedral. The effect was quite mind-altering and had such a different impact to the original setting. Hail, Gladdening Light by Charles Wood made a good contrast to the first song complemented by the subsequent item, Harris's Faire is the Heaven. Eric Whitacre's three songs, I hide myself in the first half with its electric, swerving dissonances; Go Lovely Rose and With a Lily in your hand after the interval were highlights of Saturday's concert. The tidal wash of the voices in Go Lovely Rose was followed by the more rhythmic third song. Ralph Vaughan Williams's Linden Lea as the concluding item on the program was a real treat recreating the composer's rural idyll with the smooth phrasing from the choir. I had not remembered how pleasing the distinctive timing is in this setting until hearing it again and relishing the well enunciated lyrics. The beauty of Saturday's concert was the way in which the lyrics have continued to work in the memory through activation by the musical performance. This concert represents another fine musical gift from the Oriana Chorale.